Warwickshire Justice Centre where Leamington Police Station is located. A Warwickshire man threatened to bomb Leamington and assaulted a police officer having returned to alcohol, a court heard today (Monday, June 26). Martyn Gardner, who confessed to having an alcohol problem, was sober having left prison in September but drank while out for a friend’s birthday in Alcester on June 10. 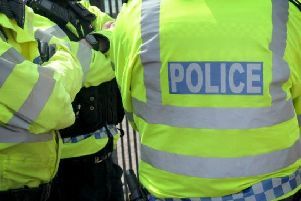 The 38-year-old unemployed man, of Meadow Road, Alcester, ended up being verbally abusive towards police officers, saying he would bomb their houses, and punched one in the face. Gardner was made to pay a total of £250 after pleading guilty to assaulting a police officer while on duty plus drunk and disorderly behaviour at Leamington Spa Magistrates’ Court. Police were called to St Faith’s Road just after midnight on June 11, by Mr Gardner who told 999 call handlers he planned to break into a nursery. He added: “Officers describe Mr Gardner as under the influence of alcohol, exhibiting the usual signs and symptoms, including slurred speech. “The assault upon Constable Harris was witnessed by his colleagues, and prior to the assault, he said, ‘you t****, what are you going to do, I will bomb Leamington and Stratford, I will bomb your house, your house and your house,’ directing those threats towards all three officers. “Constable Harris, in his description, in an attempt to arrest Mr Gardner once he’d made those threats, he describes Mr Gardner nudging towards him and during the course of which, he’s thrown several punches which the officer has managed to block. “It appears during the course of one of those exchanges, the force caused the officer to lose his footing. “Constable Harris’ injuries were treated by ambulance staff and it appears he received a wound just near his cheek area. Gardner has 29 previous convictions, totalling 42 offences, but the majority are dissimilar to the incident in Alcester, which was his first violent offence, Mr Atwal said. In July, 2016, he was jailed for 24 weeks and was released in September. A probation service representative told the court Gardner had attended all 15 appointments since his release, as made to by his licence, and was receptive. But she said the June 11 offences suggests he has returned to alcohol, and the nature of offences relates to ‘binge drinking and alcohol abuse’. She said probation hoped the court hearing will act as a reminder for Gardner’s need to address his alcohol consumptions. Magistrates fined him £120, reduced due to his guilty plea, plus a £30 victim surcharge and £100 in compensation.